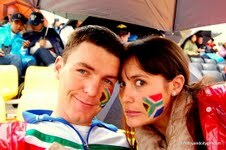 FarmBoy and CityGirl hit Asia: *Korean F1 Grand Prix*...we were there! 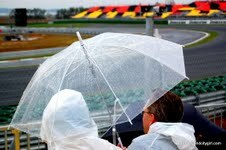 *Korean F1 Grand Prix*...we were there! 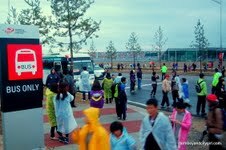 5:30am on Saturday the 24th saw 2 very, very, very excited South Africans running around Daejeon trying to find a taxi to get to the station in time for the 6 o'clock KTX ride to Mokpo. Why, i hear you ask? 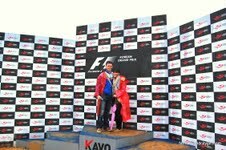 Well, to see the FIRST KOREAN F1 GRAND PRIX!!!! And having not checked the weather report the night before, we were unprepared for what lay ahead. It was windy, It was cold, it was wet, it was muddy...but it was fantastic!! We arrived early bells at Mokpo Station, running around in the pouring rain in search of a cup of coffee and an umbrella; found the one in a seedy convenience store, and the other in a sparkling new coffee shop. After a rather tense disagreement regarding sharing umbrellas vs just buying my own one (Farmboy I'm sorry for being so difficult!) We set out in search of a way to get to the track. So far so good, we hoped on the first bus we could find that was showing a F1 sign on it, and 10 minutes later we arrived at the brand spanking new track. Looking around at the empty stands, the half finished stands, the nuts and bolts lying all over the show, the mud caked all over the paths, the lack of paths, the very stressed looking officials, the wet spectators, and of course the already-nearly-flooded-track, we wondered how the day was going to play out...From the looks of the people huddled around us, it did not look good. And so the hours ticked by, more seats we bolted into place, more people trickled in, an extremely loud family of 'professional F1 commentators' (I'll let you guess which country they were from hehe) arrived and plonked themselves right behind us, and proceeded to rage about the event, how they were going to complain to every news station they could get hold of back home, and last but not least, how inconsiderate the people in front of them (thats us folks) were for letting their umbrellas drip onto them.